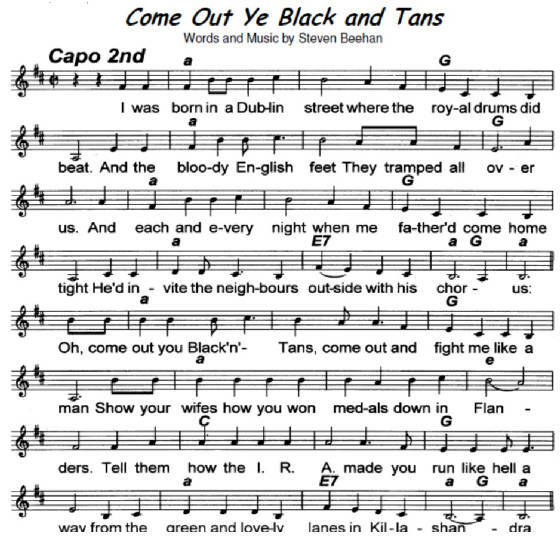 written by Steven Behan and first recorded by The Wolfe Tones. An Irish rebel song. The tin whistle notes in D are included. The Youtube video is by Jean-Baptiste Meynard on tin whistle, he's using a Generation whistle while playing along to The Davitts version of Black And Tans. The notes he's playing may not be in the same key as the sheet music. By the way, in the sheet music above you'll see a small ''a'' , this means to play an Am chord. It's just that the music was sent in to me by a man from Germany and that's the way they write an Am in Germany. As you can see, the version of the sheet music below is the same as above, I just decided to add the lyrics to the tune to make it easier. I hope this works out for you's. I worked this for the D whistle, but it works just as good on a C.